In case you are a tad recipe-deprived, I have some summery ones for you this week, starting with these delightful cookies. And! One day this week, we will be welcoming a guest poster who may possibly flip your world upside down (when it comes to preserving). At least she flipped mine around. I'm still working on picking things up off the floor. I'm naming these cookies ultimate because they have everything. They're made with oats, peanut butter, chocolate chips, zucchini (of course) and they are amazingly soft and chewy. I just do not like hard, dry cookies. I do not like them Sam-I-am. Now these, I would eat with a fox and in a box, on a train and in the rain...yeah, yeah...okay. You get the idea. In the bowl of your electric mixer, beat butter, peanut butter and both sugars. Add eggs and vanilla and beat well. In another bowl, combine flour, baking soda, salt and oats. Gradually add flour mixture to mixing bowl and beat until well combined. Fold in shredded zucchini and chocolate chips. Drop by tablespoon onto greased cookie sheets. Bake at 350 degrees for 7-10 minutes or until the edges turn light brown. This is important: because they are a soft cookie, let them cool completely on the cookie sheets. Remove them when they are cool and store leftover cookies in the fridge between layers of wax paper (if there are any). Ooo. We are going away this weekend for a few days. These will be perfect for a half-healthy snack/dessert! I was planning on making normal choco chip cookies but these will be much better. Thanks! I am also starting to can some. Your stories have been most helpful and encouraging! Check out my blog if you have a minute. SOUNDS DELICIOUS --EVEN WITH HAY IN MY HAIR OK OK JUST CAUSED MY HUSBAND A COUGHING ATTACK-FIRST WE DON'T HAVE A BARN AND SECOND --WE CAN WISH!!!!!!!!! I don't like crunchy cookies either...if I want crunch I'll eat a cracker! I wonder what my son would say about the green things in the cookie. Oh, I know, he'd say, "What are the green things in the cookie?" And he'd scrunch up his nose. But it might be worth a try! Yum! I love zucchini bread and these cookies look like little bites of goodness. Thank you for the recipe. Do these taste like regular choc. chip cookies? or does the zucchini taste come through to add to the regular ccc taste? I think they taste very different because of the oats and peanut butter. 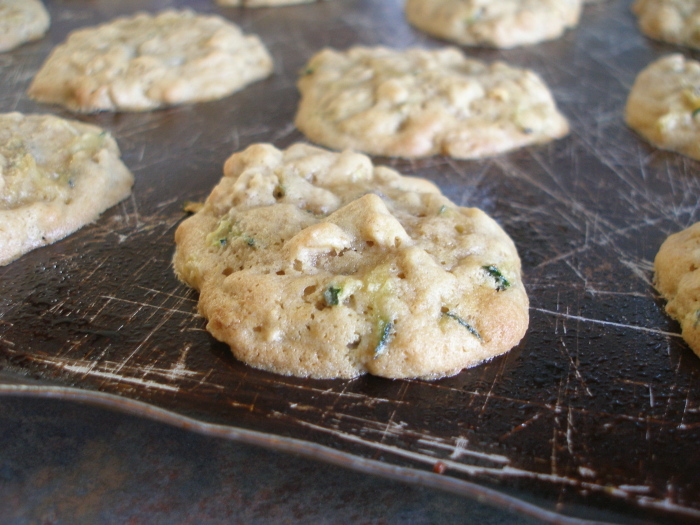 The zucchini helps keep the cookies moist, but the zucchini taste is not dominant. I hope this answers your question:-). I'd like to use greek yogurt for the butter. Thanks for another way to use zucchini! Just made this and added a smidge of cinnamon and then got crazy and added cocoa powder to last batch! yum. Any reason why these need to be refrigerated other than to hide them? I kept them in the fridge because they were so soft (and to keep them out of my line of sight for most of the time:-)). I came to your site to look for zucchini and had NO IDEA I would find this recipe that has all my cravings in one baked good! I have been craving peanut butter, chocolate and I have zucchini from my garden sitting on my counter. I am gluten free and substituted out the flour for GF flours and I am hoping for the best! I couldn't quit eating the batter! They are spreading out more so than your cookies, but I expected that to happen. Time to get them out of the oven! They look and smell sooo good! Waiting till they cool some, then I will try one! (Five minutes has passed) Perfectly wonderful! Thank you! I will share with my GF friends! I also used GF Pantry flour. Yumm! going to try these cookies tomorrow. i love your philosophy on life. i'll definitely check out more of your posts and try a lot of your ideas and recipes! I made these in bar form: use jelly roll pan and bake for 15 minutes. Super easy and delicious! I freeze shredded zucchini each year. 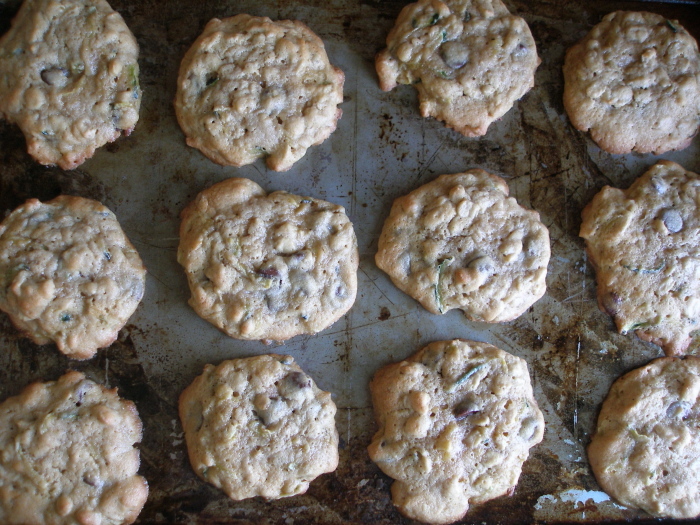 I am wondering if you have ever tried frozen zucchini in these cookies. I am thinking it would be fine as long as I drain it well after thawing it. What do you think?